Todos Santos Beachfront Vacation Rentals...your direct source! Simply click on above number of bedrooms desired to see photos and full description! We are offering the Pescadero Palace, which accommodates from 1-18 people, and is one of the finest luxury beachfront Todos Santos vacation rentals in the Todos Santos and El Pescadero area of Baja California, Mexico. Our goal is to make your vacation as pleasurable as possible, and give you the best possible vacation rental at the best possible price. Our spectacular beachfront Todos Santos vacation rental, the Pescadero Palace, has a 3BR Main Villa (including the 1BR Penthouse with a private entrance) and 4BR Guest House, connected with a walkway, pool, and patio. The Villas are located on a 3-mile white sand beach in the quaint town of El Pescadero, only 45 minutes North of Cabo San Lucas and 5 minutes South of the charming town of Todos Santos. Sitting on Playa San Pedritos, one of the best surf breaks in Baja California, these two 3-story Villas have a total of 7 bedrooms and 8 baths that can be rented all together for large groups, or separately for smaller groups. There are also two Jacuzzi hot tubs, one with an infinity edge flowing into the private heated swimming pool. The pool includes a shallow area for children, as well as a beautiful natural rock waterfall. El Pescadero Palace is one of the nicest vacation homes in the area, and has all the luxury and amenities of the finest beachfront accommodations, including 7BR/8bath, heated swimming pool, 2 Jacuzzi’s, 7 satellite TV’s, high speed wireless internet and computers, 4 kitchens with all appliances and utensils, spectacular ocean views, laundry facilities on premises, and maid service available upon request. These beachfront Todos Santos vacation rentals are located only minutes to the beautiful town of Todos Santos, Mexico with its artisans and art galleries, pristine beaches, amazing whale and bird watching, gourmet restaurants, mountain hiking, fishing, yoga, and much, much more! It is also home of the original Hotel California, made famous by the Eagles song of the 70’s. No wonder it was given the status of Pueblo Magico (Magical Town) by the Mexican government for recognition of its unique qualities on October 23, 2006, granting local, state, and federal funds for the improvement of the town and infrastructure. There are also several local beaches off the beaten path that are only minutes away, including Hidden Port (AKA Pirates Cove), and Palm Beach with it's beautiful palm grove and natural sweet water spring bubbling up from underground. Todos Santos, Mexico was originally a mission, Nuestra Señora del Pilar de La Paz, founded by father Jaime Bravo in 1723, and later thrived as a major sugar cane capital in the late 1800’s, which is evident by the ruins of the original eight sugar mills in the area. Although populated by native Indians off and on for thousands of years, Todos Santos did swell to over 10,000 in its peak before being nearly abandoned. The census of 2005 showed a population of 4,078, which has now expanded to well over 6,000 and it’s still growing at a rapid pace, as well as interest in Todos Santos vacation rentals and homes. El Pescadero and the surrounding area has also shown steady economic growth, and has proved to be a good investment with property values soaring in recent years. With it's abundance of fresh water, and the new 4-lane highway now finished from La Paz to Cabo San Lucas, the town will continue to thrive as a major tourist vacation destination for the traveler seeking peace and tranquility that can only be found outside of the big cities. Baja California has something for everybody. 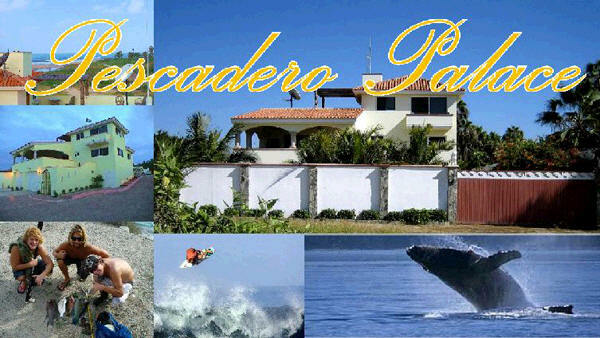 Whether it is the action of world class surf, diving, and hiking, or just relaxing around the pool and Jacuzzi with a cold drink and a book, you can enjoy it all at the Pescadero Palace on your Baja vacation!